Storage container units are all the rage on HGTV, but they’re starting to pop up in real life too. So let’s talk about them. Today I have an interview with James Roberts who handles design and engineering at TAYNR, a container home builder in Sacramento. I hope this will be insightful and interesting. Anything to add? Let’s talk in the comments. Ryan: What got you into the storage container business? James: I first became aware of “shipping containers” when I was a Signalman in the US NAVY. Seeing them in different commercial ports was common. After the NAVY I moved to Miami Beach where I met Sujan (Project Manager at TAYNR), and we would see shipping containers on large cargo ships, cruising in and out of the Miami Port all the time. But Denmark was the first container build I ever saw. And then London had container condos and a shopping center. Thailand, Laos, Korea Japan, Mexico, Costa Rica, Brazil all have many small pop-up businesses, single family homes and commercial buildings. During recent visits to China and Hong Kong, I saw new construction sites with 100s of containers modified for worker housing. Ryan: What type of buildings can you make out of containers? James: The possibilities are endless. The ISBU (Intermodal Steel Building Unit), the shipping container, is manufactured to carry heavy cargo of all kinds, to be stacked, and withstand extreme weather conditions while being transported across the seas. With that said, they are incredibly strong, and if modified correctly, they can be used for an endless amount of structures. Australia has been using containers for housing and commercial structures for 40+ years. America has recently (+/-10 years) started to use this building method for single family and multi-family homes, commercial store fronts, popup food stations, business marketing structures, etc. The worker housing units would be an excellent source for all means for temporary housing in the US. Emergency, migrant, farm, homeless, camping, etc. The list can go on. Ryan: What is the maximum number on stories you can do? James: They are manufactured to stack on top with the weight bearing on the four corner posts. It is common to see them free-standing 6 boxes high at the port. This is without reinforcement or anything securing them together. You can imagine that with additional engineering and structural support, this could easily be doubled, possibly tripled. Ryan: Tell me about the accessory unit you built in Oak Park (the blue unit below). James: Matt and Jamie Leonardo contacted me in late 2016. They bought their Oak Park home a few years before and had worked up some equity. Originally there was a non-permitted home along the back alley way that had to be torn down in order for their loan to be approved. Replacing this structure for a revenue generating dwelling was pretty much in the plan from the beginning. I do not remember where/why they decided to build with a shipping container, but we met, discussed a plan and moved forward. This home will actually be showcased on an upcoming episode of You Live In What, premiering June 29th at 9 pm on Great American Country Network (GAC), an HGTV affiliate. Ryan: Do units get extra hot on the inside because of the steel exterior? James: No, our units are meant to perform extremely efficient by design. By nature, corten steel will absorb the heat from the sun. This is a factor that is taken into consideration from the beginning and we have many different ways to address this. For instance, the Oak Park container home is insulated on the inside and has reflective paint on the outside. Also, a weather barrier and facade were installed on the exterior of the container to allow for a 6?+ thermal break. The roof has a 3:12 sloped standing seam roof with 3’6? eves to provide additional shade along with the insulation and weather barrier laid out inside the roofline, and it has 2 mini-split for heating and air. Ryan: What type of units do you find most clients are asking for these days? James: Our highest demand for individuals is an ADU (Accessory Dwelling Unit) that can be installed in existing backyards for in-law quarters, guest homes, or as a rental unit to capture additional income. The TAYNR models are designed to be “building blocks” offering both 20′ and 40′ multi-block models. 1, 2 & 3 bedroom units with 1 or 2 baths. Ryan: How long does it take to install an ADU? James: Foundations can be installed in 1 day, and installation of the ADU is typically 5-10 business days depending in the model size. Ryan: Is it fairly easy to get a storage container unit permitted? James: “Easy” is absolutely not how would describe it. However, because we have our pre-designed models and engineering understood, this does simplify our process. Ryan: Do you know if there is a limit to how many units can be added in a backyard? James: Any residential lot in California can have one ADU as long as the property setbacks and design review conditions can be met. So far the only issue I have run into is physical access, which TAYNR now offers an alternative modular product that can usually meet this conflict. Ryan: Have you found some areas not willing to allow containers because of design restrictions? James: Usually this is due to the City/County design review. Some areas require the ADU be cohesive with the existing structure. As long as budget allows, this is not an issue because we can design a facade to satisfy this point. Ryan: So far I’m not aware of any stand-alone single family container units in Sacramento. Have you heard about any yet? James: There currently is not a stand-alone unit in Sacramento. Stay tuned… we have one in the works. Ryan: What are the costs like for a storage container accessory unit? James: Models and pricing are listed on our website (here). Ryan: Are permit fees any different for containers compared to stick-built homes? James: No, they are not. Our builds are required to meet the same building codes and are permitted the same as a traditional build. James: One of the biggest misconceptions is that building with containers is “cheap”. This is not the case. Although there are absolute savings if the build process is followed properly. Meaning, the onsite work should be performed while the ADU is being built in the factory, so the overall start-to-finish construction is significantly reduced, saving you a lot in labor cost. Ryan: Thanks for doing the interview. You killed it. Everyone, please check out TAYNR’s website. All photos in this post are TAYNR projects (images are property of TAYNR). CLOSING APPRAISAL THOUGHTS: Container homes are an emerging trend in the market, so it’s important to stay in tune with this phenomenon. I’m excited to hear TAYNR is building a stand-alone home too because that’s not something the market has seen yet. It’s worth noting one of the struggles with stand-alone container homes is the potential of financing hurdles: 1) The unit might not be large enough in size in the eyes of the lender; and 2) A lender might ask an appraiser to use container comps to show the market accepts this type of property. Well, right now there aren’t any comps (yet). But the market is craving alternative products like this, so lenders over time will hopefully adapt to this emerging trend. Questions: What do you think of container homes? Any insight or stories to share? Loan officers, any tips on financing? I’d love to hear your take. How much is that accessory dwelling worth? How do we really put a value on it? It’s not always easy to figure that out in real estate, so I wanted to share some of the issues I tend to think through as an appraiser when there is an accessory unit on a property. Anything you’d add? I’d love to hear your take. 1) Comps: How much are other homes with accessory units selling for? This is a fundamental question to ask. Since data is often limited we might have to look through years of neighborhood sales (or competitive neighborhoods) to try to find something that has sold with an accessory dwelling unit (ADU). Even if the sales are older or a bit different in size we can at the least come up with a percentage or price adjustment to try to get a sense of what the market has been willing to pay. Ideally we’d find three model match sales in the past 90 days, but that’s probably not going to happen. Remember, we might not use the really old sales as comps, but we can still use some of the older data to get a sense for how the market has behaved regarding accessory units. 2) ADU Minimum: At a minimum an accessory unit needs to have a bathroom, sleeping area, and kitchen. This means an outbuilding without a bathroom really isn’t an accessory unit. And that Man Cave / She Shed isn’t an accessory dwelling because it’s basically a game room meant for hanging out instead of living. 3) 2nd Unit or Not: Are we dealing with a second unit or an accessory unit? It might sound like I’m splitting hairs to ask this question, but there is actually a difference between a full-fledged second unit and something that would be classified as an “accessory” unit (or “Granny flat”, “Mother-in-Law” unit, or “Guest Quarters”). I wrote a post here to describe the difference. In short, whether something is a full second unit or merely an accessory dwelling could potentially change the way we approach valuing the unit and which comps we choose. 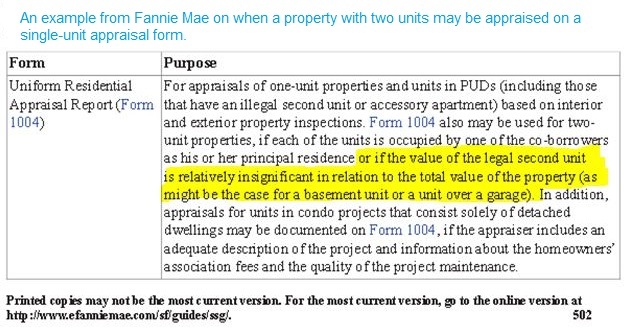 4) Just a House: How much would the property sell for if it just had a house without an accessory unit? This doesn’t help us put a value on the accessory unit, but in a sense it helps us start gauging value for the neighborhood. This at least gives us a place to begin. 5) Combining Square Footage: Often times an accessory unit’s square footage gets lumped into the main square footage of the house. This happens in MLS and sometimes it happens in Tax Records. So we might read a home is 2000 sq ft when in reality the main home is only 1400 sq ft and the accessory unit is 600 sq ft. In this example we don’t really have a 2000 sq ft house but rather a 1400 sq ft house with an accessory unit. The question becomes, could the subject property sell on par with homes that are 2000 sq ft? Maybe. Maybe not. This is where we have to do research. I will say quite a few properties are priced based on a lumped square footage and then they end up sitting instead of selling. This is not always the case, but it reminds us to be careful about assuming a home with an accessory unit is always going to have the same value as a larger home. 6) Permits: Was the accessory unit permitted? If you are hoping to see more significant value recognized for an accessory dwelling, having permits is a key factor. My friend Gary Kristensen in Portland wrote a post on ADUs and he says, “Provide the appraiser and your lender with documentation that your ADU was legally permitted. Also, list information about rental income, expenses, and detail construction costs (if your unit was recently constructed).” Good advice, Gary. 7) Rent: Can the accessory unit be legally rented? What is the market rent? This is where we might use the Income Approach to come up with a value (another blog post). Imagine an accessory dwelling has a market rent of $1000 per month. Now imagine an appraiser says the extra unit is worth $10,000. Does that seem reasonable? Doesn’t it seem low right away since the unit would be 100% paid for after 10 months? Or imagine a unit rents for $300 but it’s being given $150,000 in value. Doesn’t that seem excessive based on the low rent? Thus sometimes when we know market rent we can begin to sniff out whether a value adjustment is even approaching reasonable. 8) Square Footage Adjustment: If I’m adjusting $50 per sq ft for extra square footage in my report, would it be reasonable to see that same adjustment for the 600 sq ft accessory dwelling? This is only a question I ask myself. There isn’t a constant where the market will pay the same amount for square footage for the main dwelling and something else (converted basement, converted garage, accessory unit). Part of it depends on quality too. If the extra unit has a quality clearly below the main house, it’s probably not reasonable to see buyers pay the same amount for square footage outside the house. Though if the quality is the same, we might be looking at an adjustment that is similar or the same to that which is given to the house. Again, there is no rule here. This is only a question I ask myself in the background when approaching an accessory unit. I would never automatically give an adjustment like this. Remember, square footage adjustments are NOT based on the entire value of the property divided by the square footage. 9) Cost vs. Value: We all know the cost of something doesn’t necessarily translate to the value, but cost can help us gauge quality. There might be a difference in value for an accessory unit that cost $125,000 compared to $15,000, right? This is basic logic, but let’s not overlook the importance of it. Questions: Anything you’d add? Did I miss something? If you work in real estate, how do you come up with the value of an accessory unit? I’d love to hear your take.